Canada’s one hundredth birthday in 1967 was celebrated with much fanfare throughout the nation. To mark this auspicious anniversary, the federal government earmarked millions of dollars to be used for commemorative community projects. In Sechelt, it was decided that a new Library facility would be a fitting centennial project for the community. Fundraising began in earnest in the Summer of 1966, with $450 raised at the annual Halfmoon Bay Country Fair going to the proposed Library4. Further donations from various individuals and community groups, as well as the proceeds from the sale of commemorative centennial playing cards, were matched by government grants; the community soon had the $2800 necessary to build the new Library5. Alice French, founder of Sechelt’s first Library, sold the new Library movement a plot of land on Trail Avenue for $1200, well below market value6, and local merchants led by Bank of Montreal manager Ernie Booth donated floor tiles. Norman Franklin, a local contractor, built the facility for a “nominal charge”7. The desk of Thomas John Cook, Sechelt’s first resident Justice of the Peace, became the circulation desk. Construction began in October, 1967, and the new Sechelt Centennial Library was officially opened by the Honourable Isabel Dawson, MLA, on December 17, 1967. A time capsule, containing coins, centennial memorabilia, and copies of local newspapers, was buried on the occasion by Ada Dawe8. 1972 marked the centenary of British Columbia’s entry into confederation and, to mark the occasion, improvements were made to the Sechelt Centennial Library, including the addition of an archives. These improvements were dedicated by Premier W.A.C. Bennett on June 17, 1972.
and of the archives, June 17, 1972. In 1973, the Village of Sechelt purchased the lot next to the Centennial Library with the intention of expanding the Library’s facilities. Also in 1973, the debate over the establishment of a single regional Library for the Sunshine Coast, an idea initially suggested in 1955, came to the fore. In an editorial entitled “Developing a Library System”, the Sechelt-based Peninsula Times suggested a merger of school and public libraries on the Sunshine Coast. In June, 1975, Sechelt Alderman Norm an Watson suggested that the public libraries of the Sunshine Coast amalgamate in order to present a united front in dealings with the provincial government9. Later that summer, the Sunshine Coast Regional District fanned the flames of controversy by giving a total of $3000 to the libraries in Sechelt, Gibsons, Port Mellon, Roberts Creek, Wilson Creek, and Pender Harbour on the condition that the libraries consider a “liaison”10. The possibility of forming a Coast-wide Library Board, separate from both the existing municipal and regional authorities, was also suggested11. By the end of the 1970s, controversy also arose over the size and location of the Centennial Library. A provincial regulation requiring libraries to have an area of at least 1500 square metres prevented the Sechelt Library, at only 900 square metres, from qualifying for government grants. Furthermore, the various local governments were seriously considering the construction of a single building housing the School Board, Village of Sechelt and Sunshine Coast Regional District offices, and the Sechelt Centennial Library. In February of 1981, the Village of Sechelt proposed the sale of the Library building and the establishment of a new Library at Rockwood Lodge, a heritage building to the north of the Village centre. This proposal was quashed by protests from Library volunteers and the public who argued that the Rockwood location was “remote from the regular Library clientele”12. Around this time, the Sechelt Library also experienced a shift in governance. 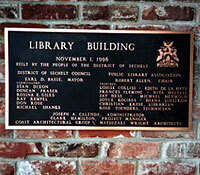 In April of 1981, in order to conform with the provisions of the provincial Library Act, the Library’s ad hoc governing body was officially incorporated as the Sechelt Public Library Association. When the Sechelt Public Library Association (SPLA) was established in 1981, the Sechelt Centennial Library had a total membership base of 250 patrons and a collection numbering approximately 6 000 books13. Furthermore, it was generally acknowledged, both by those associated with the Library and by the Village of Sechelt, that the Library needed more space to effectively serve the needs of Sechelt and of the surrounding communities14. The SPLA held its first meeting on May 14, 1981, and an interim board was elected with Merv Boucher as Chairman. Around the same time, the Library inherited much of the collection of the recently closed Port Mellon Library. By March of 1982, the Library boasted a membership of 347 patrons and a collection numbering upwards of 11 000 volumes. In 1983, an addition to the Library was formally proposed and solicitations were made to governments, both local and provincial, for funding. 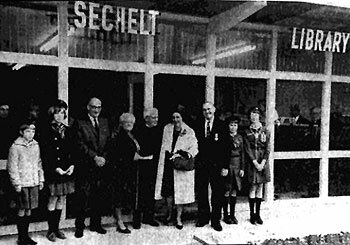 In May, 1983, the Village of Sechelt granted the SPLA $15 000 for an expansion to the existing Library facilities. Construction began later in 1983 and a tentative completion date of June 1, 1984, was set. For its entire history, the Sechelt Public Library had been operated exclusively by volunteers. This changed in 1987 with the hiring of the Library’s first paid employee, Anita Halsall being hired as a clerk and typist. The first full-time, paid librarian, Rose Toenders, was hired in 1990. Christian Kruse took over as head librarian in 1996, and Iris Loewen took over in 1999. Iris retired in 2009 and was followed by Helen Prosser (2009-2013), Margaret Hodgins (2014-2018), and Shelley Archibald who was hired in 2018. In 1987, the Village of Sechelt expanded to include Davis Bay and Wilson Creek; the name of the municipality was changed to the District of Sechelt. As the provincial Library Act prohibited more than one public Library or Library system from operating in a single municipality, the Davis Bay-Wilson Creek Reading Centre became a branch of the Sechelt Public Library. In 1989, the possibility of constructing a new Library was once again raised. 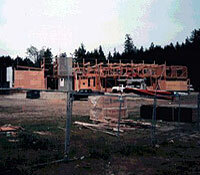 Two years later, in 1991, the British Columbia Building Corporation expressed an interest in purchasing part of Block 7, an empty lot located next door to Trail Bay Mall, for the purpose of constructing a new provincial courthouse; it was suggested that a new Library, municipal hall, and fire department be built on the same site. Though the courthouse and fire department proposals fell through, Sechelt Council voted in 1992 in favour of building a joint municipal government and Library facility on Block 7. Interestingly, Block 7 had been considered as a possible site for a new Library as early as 197915. On November 20, 1993, a referendum to borrow money for a new Library passed by a margin of 1244 – 785. The library was designed by architect Eva Matsuzaki and local architect Kevin Ryan. 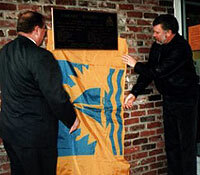 Ground was broken for the new facility on Block 7 on February 22, 1996, and the new Library was officially opened by Sechelt Mayor Earl Basse and SP LA Chair Robert Allen on November 23, 1996. The Sechelt Public Library has expanded and prospered since the move to its new location. By 1998, the collection numbered almost 27 000 items, including audio-visual materials such as compact discs and videos, and membership had passed 5500 patrons. 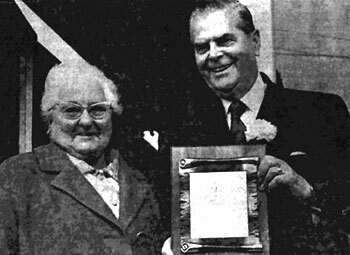 This history is based almost entirely on the newspaper clippings and manuscript reminiscences held in the Helen Dawe Archive at the Sechelt Public Library. Frances Fleming’s unpublished chronology History of the Sechelt Public Library Association and the attempts to provide Sechelt and Environs with a modern Library facility provided the basis for the history of the Library since 1981. 1Manuscript, Helen Dawe Archive. December 17, 1980. 4“Redrooffs-Halfmoon Bay enjoy successful event” Peninsula Times July 26, 1966. 5Connor, Peggy. “School Bells Ring” Peninsula Times August 29, 1979. 6Centennial Library. Manuscript, Helen Dawe Archive, January 14, 1981. 8Letter from Helen Dawe to Alderman Joyce Kolibas, December 17, 1981. 9“Amalgamation of Libraries Suggested” Coast News. June 11, 1975. 10“Libraries given $3000 with strings attached” Sunshine Shopper. August 6, 1975. 12Undated, untitled manuscript, Helen Dawe Archive. 13Moore, John. “A Look at Sechelt Library” Coast News. 15“Sechelt interested in site” Peninsula Times. August 1, 1979.